← Luxury Dive Watch: Is it all the same? 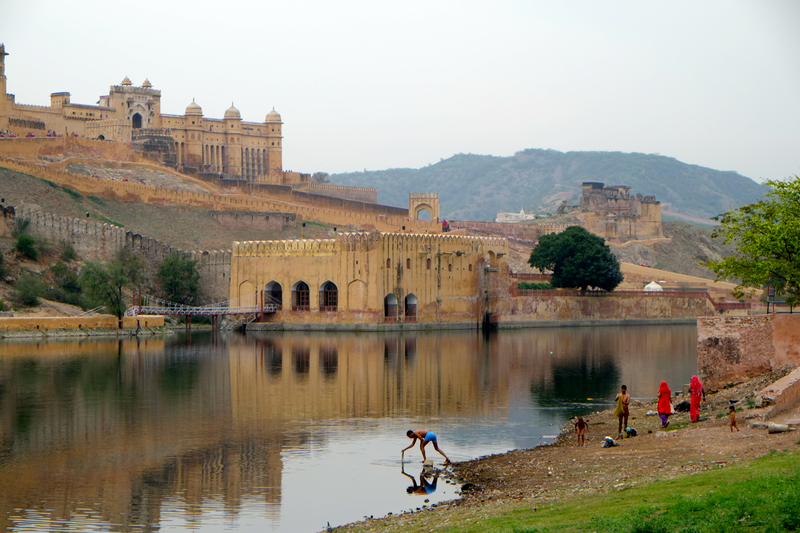 Amber Fort in Jaipur, Rajasthan, India. The structure is HUGE. We woke up at 6 am this morning after a lavish night sleep, we still had two and a half hours before our appointment with our tour guide. We took a shower, organize our stuff inside our luggage, then come down to the restaurant lfor breakfast. We eat omelette, plain bread and prata while watching the road of Jaipur from the window beside our table. The restaurant manager became quite familiar with us, he also served us tea. When we went to the lobby, a Travel World Experience representative introduced himself and explained us the itinerary for today. Ram, our driver waits outside and ask how was the stay in Libra Hotel which was nice. The first stop today is Hawa Mahal, a small palace build for the royal women with lots of window and shades, so they could see the people in the city while we can’t see them. It is located across a market and the pedestrian road om the frong of the building is fenced, so tourist have to cross the road to take a photograph without tilting the camera too much. Crossing roads in India is a serious business and shouldn’t be taken lightly, the car drivers here are very, very reckless and make tourist stressful. We have to be accompanied by our local tour guide while crossing because cars could come out from alley fastly and hit us. On the road cars are moving zig-zag, avoiding cows (on the main road, sometimes pig and dog) and slower moving car. For people with weak heart, being a passenger could rise your blood pressure. Our tour guide explained the city places, custom, and to whom the cows on the street belong to. Hawa Mahal in the city of Jaipur, India. 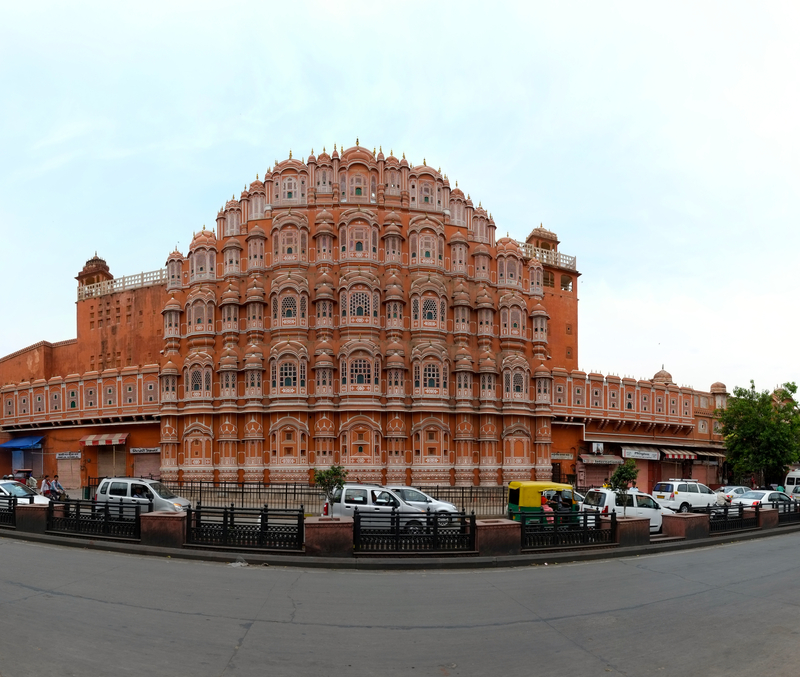 After visiting Hawa Mahal we drove to to Amber Fort, known as “Palace of Winds”, a prominent landmark in Jaipur. It is a five stories structure of sandstone plasteredpink encrusted with fine trelliswork and elaborate balconies. The palace has 953 niches and windows. Built in 1799 by Pratap Singh, the Mahal this façade was erected as a place from where the Royal ladies could view the activities of the city without being seen, the same with Hawa Mahal. A family after taking a bath in a river near Amber Fort. Before entering Amber Fort we stopped at a river across the fort to take some pictures of the gigantic structures, unexpectedly we saw local family just finished bathing in the river. Curious, I asked our tour leader why they are bathing in the river. He said it was a mystical custom believed to cure itches, but from the water appearance I think it will worsen the itches. What’s interesting on this site is the elephant ride uphill, and you bet I was excited to ride the biggest animal on the world in India. I consider it as one from many exotic experiences I had traveling, among eating zebra meat in South Africa, desert safari in Dubai, and jeep safari in Cappadocia, Turkey. 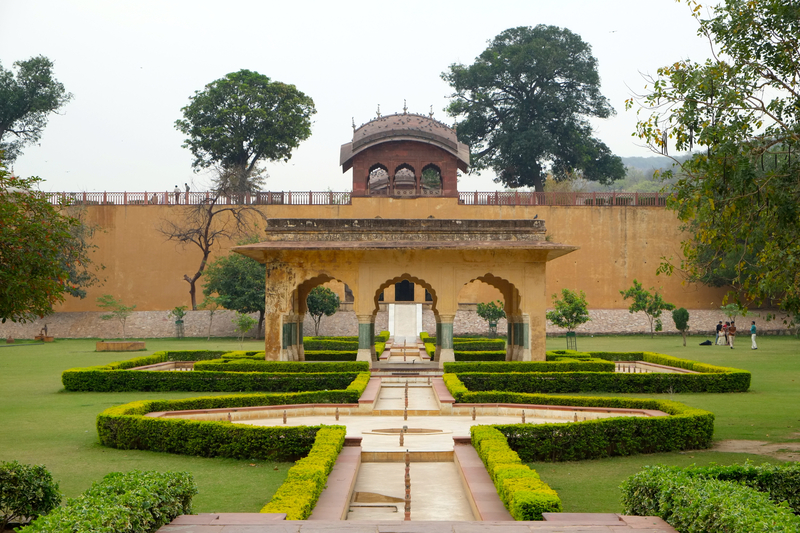 Small garden in Amber Fort, Jaipur. The ride uphill took about about 20 minutes, quite far and tiring should you choose to walk. It was bumpy so I had to be cautious holding my camera and positioning myself, my left hand hold the rail on the seat while I tried to take pictures with my right hand. I had to say the view was great from top of an elephant where we could see the cityscape and landscape, not being by the tall walls, but again taking pictures from a moving elephant is not easy and better be done using LCD screen instead of viewfinder. 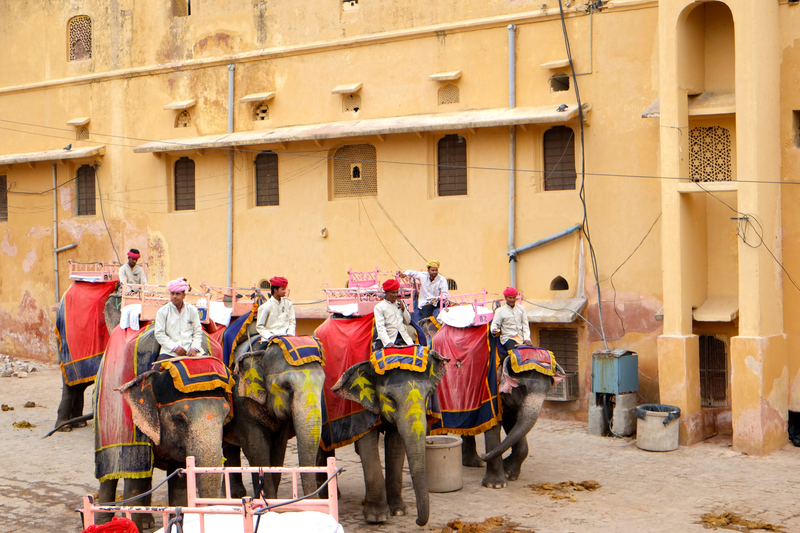 Elephant ride to uphill in Amber Fort, Jaipur. Along our ride, people are trying to take a picture of us and sell it to us later, some people also selling souvenirs. It’s important to not accept the goods before you settled on the agreeable price, and once you make an offer they’ll push you into buying until you arrived. On the top of hill we arrived at a large court and headed to staircases leading to the entrance of the castle. The castle itseld is quite large with garden, courts for the Maharani and King’s concubines (200 of them) gossiping, and balcony facing different part of the city and landscape. Nearby the castle there are two fortress where the army used to live and protect the castle, many has attempted to invade the palace in the past but none has succeedee due to the strategic position of the castle, surrounded by range of mountain and valley. After touring Amber Fort for 100 minutes, we went to parking lot located on the exit of the palace and Ram has been waiting for us there. 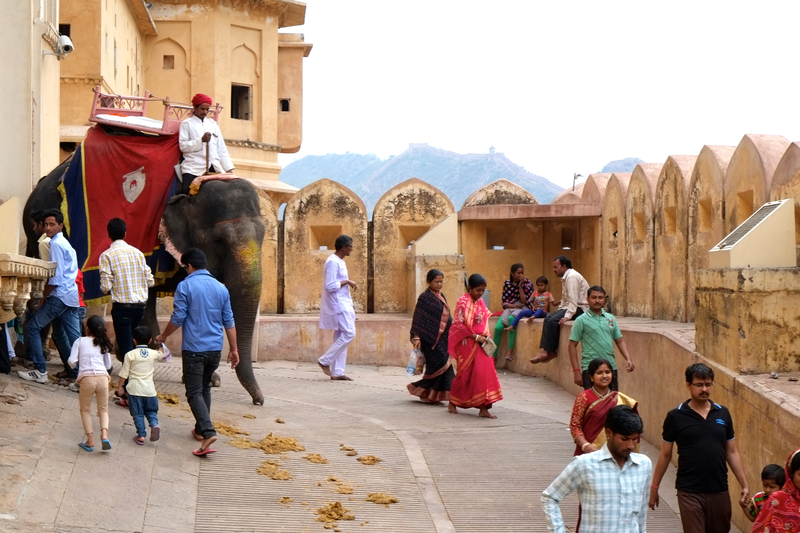 People walking alongside with elephant and its faecal on the floor in Amber Fort, Jaipur. 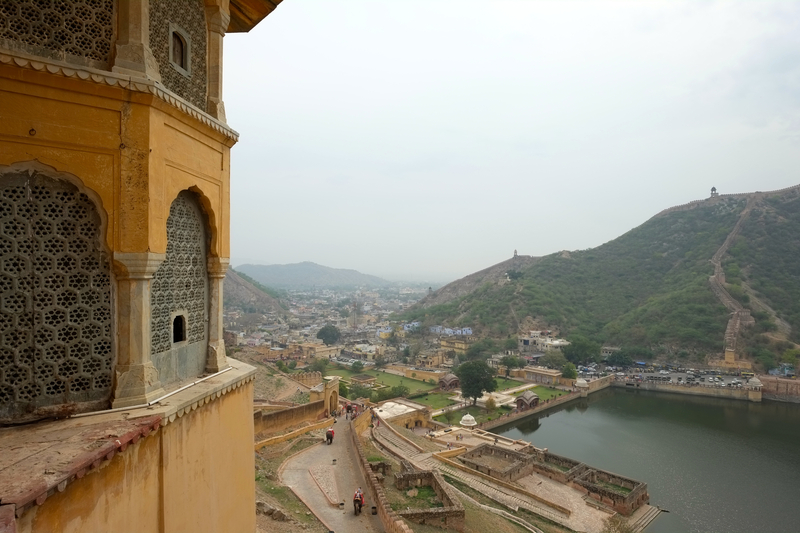 The view from Amber Fort to the city. 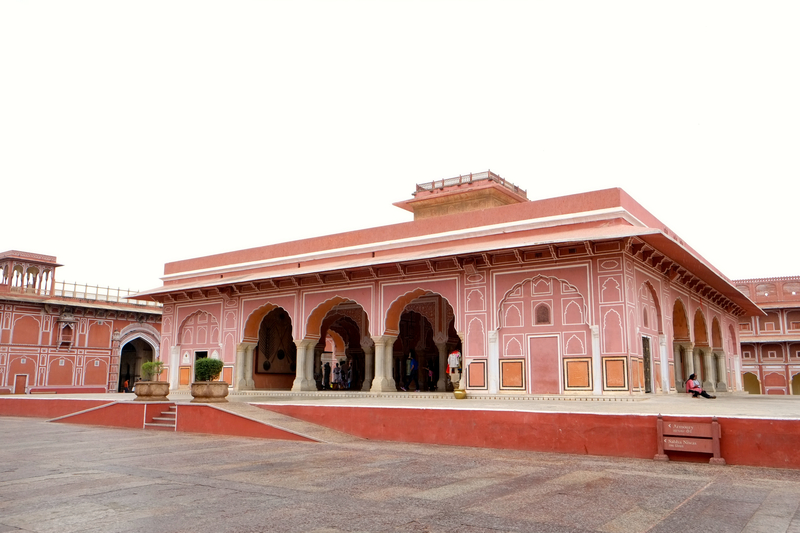 Around 10.30 we arrived at City Palace, a delightful blend of Mughal and traditional Rajasthani architecture which sprawls over one-seventh of the area in the walled city. 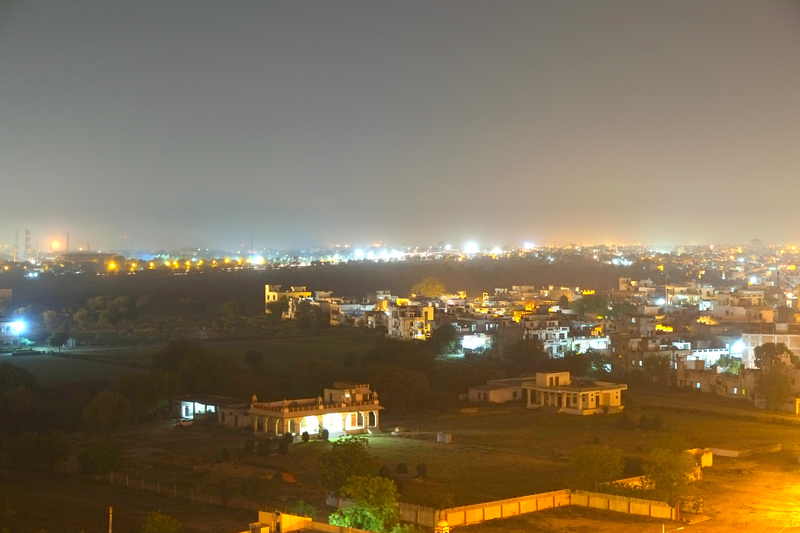 It houses the Chandra Mahal, Shri Govind Dev Temple, and the City Palace Museum. My mother did a henna tattoo for 200 rupee, and we bought souvenirs from the artist whom grandfather served the Maharaja. There are pictures of Maharaja from every era, there is one with weight of 250 lbs who died at age 39 to the one who play polo and died by heart attack when playing polo in England. In the museum we saw weapons ranging from blade, rifle, dagger, body armor. Too bad they don’t sell the replica, there is a unique lighter, gold covered with function resembles a victorinox. City Palace in Jaipur, Rajasthan, India. 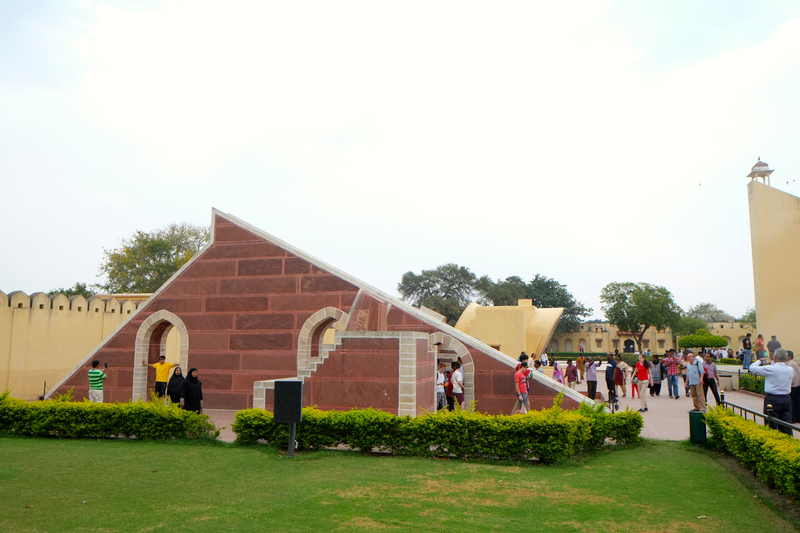 When we were finished touring around City Palace, we went by foot for about two minutes to Jantar Mantar, the largest and best preserved of the five observatories built by Jai Singh II in different parts of India. The observatory consisting of outsized astronomical instruments which still being used. 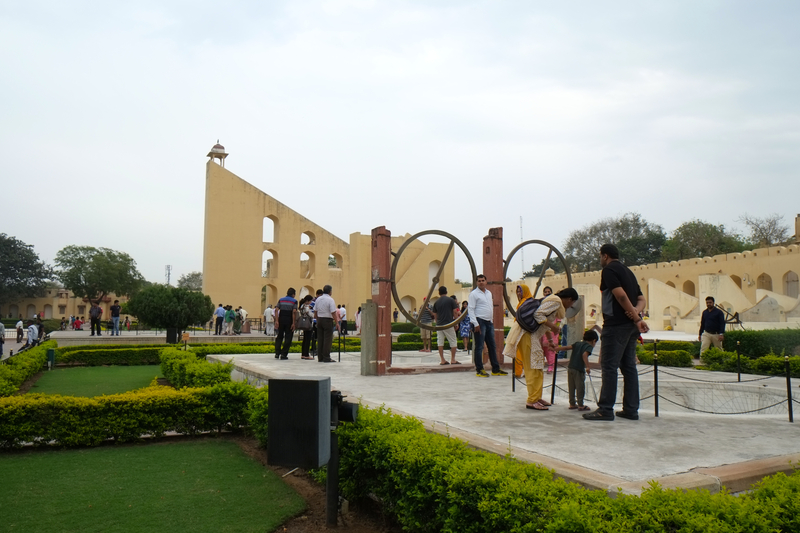 From the structures in the observatory we could use sun to calculate accurate time of Jaipur, the star constellation, even our horoscope (said to be 70% accurate). Astronomical tools in Jantar Mantar, Jaipur. We got back to hotel for lunch and rest for the day. Lunch was continental, pasta, vegetables, and chicken. We bought a wifi voucher for 24 hours cost 400 rupee in Libra hotel, then we headed to our room and relaxed. I am writing this post and my mother contacted my sister back home, checking if everything id alright. I also read mails, instagram, and such thing. Around 7.30 we had dinner, then went to the 10th floor to see the city at night from the balcony. 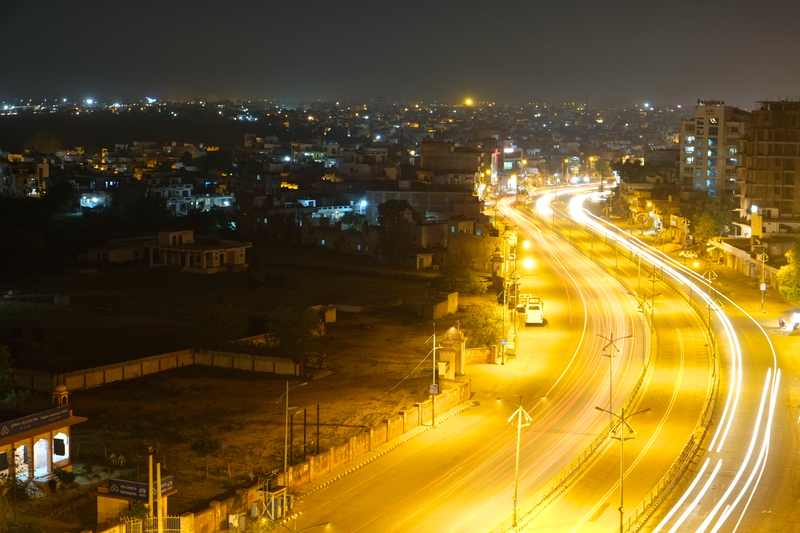 I set up my tripod and took few long exposure shots for about 15 minutes. 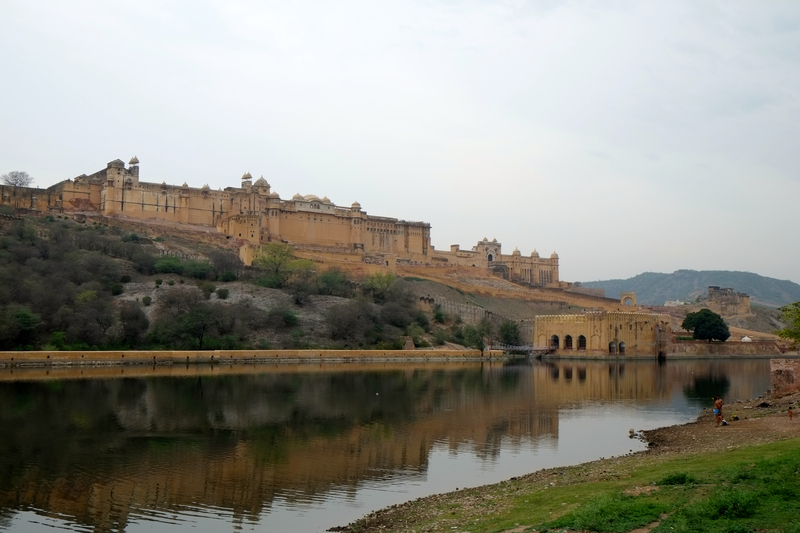 This entry was posted in India, Travel and tagged amber fort, city palace, Hawa mahal, India, jaipur, jantar mantar, rajasthan, Travel, trip. Bookmark the permalink. Beautiful and interesting account of your trip. Thanks for sharing!